Hello all you quilters out there! It's Monday! And actually a pretty nice day outside today! But a bit quiet here at the Blue Hen Quilt Shop so I thought I might take a moment to entice you with some classes coming up in the near future! A little fabric origami and some quick machine quilting makes this stunning wall hanging! 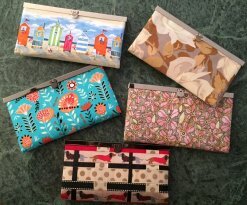 Make your very own wallet - No one will have any one just like it - unless you make it for them! Make the Rainbow Swirl, the Christmas Tree, Butterflies, Hearts or a simple Table Runner. You pick the pattern. Erin will teach you the technique! Not much time left to sign up for the Block of the Month! Our very first! 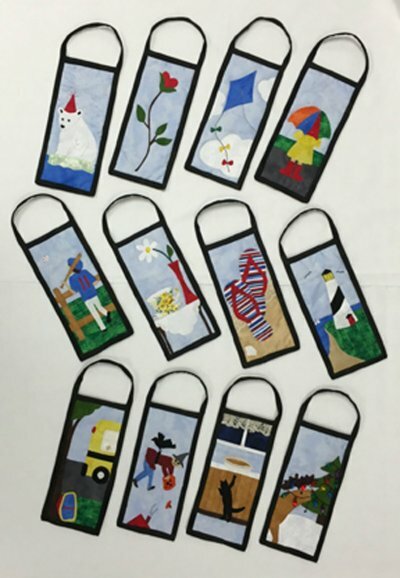 These adorable Door Hangers are actually calendar quilts! So cute and so easy to complete in a day! I used fusible applique to make these little quilted scenes. And to make it even easier, I used the applique stitching as the quilting too! Sign up for the whole year for $17.50 a month or take your chances on a month to month basis for $19.95 while supplies last! Come in or call the shop for more details 302-533-5215. Want to sign up for any of these classes, you can do so online. Just click the link below.